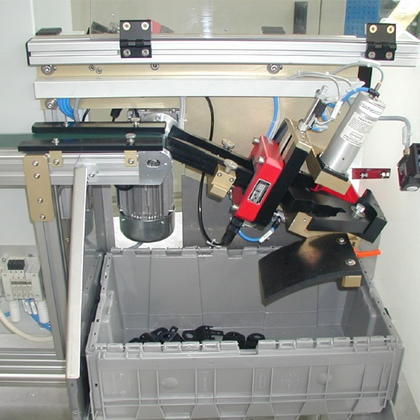 Instruments: For testing to verify correct hardness, case depth, case depth location, temper, alloy, etc. Systems designed and built by ibg NDT Systems are currently testing ball studs, tie rods, steering racks, fasteners, piston pins, rollers, pinion pins, spindles, hubs, races, steering knuckles, camshafts, gears, balls, cylinder liners, pistons, tulips, axle shafts, rocker arms, needles and many, many other components. 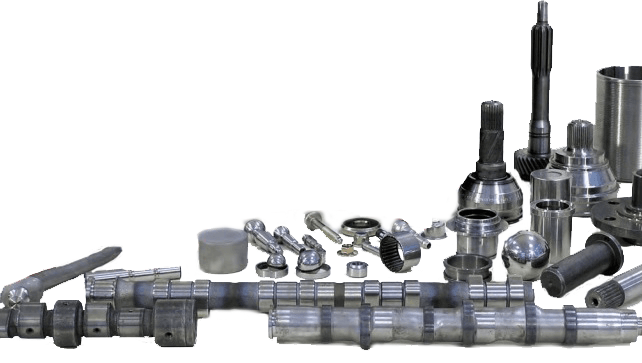 A difficult problem for in process inspection of mass parts is supervision of heat treatment results. 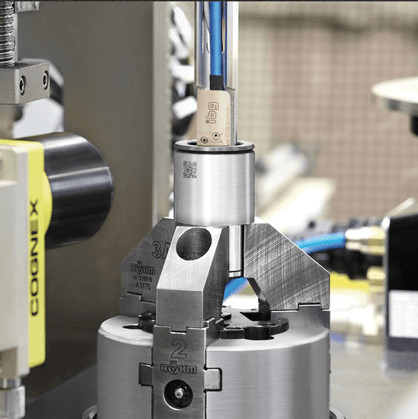 Verification of features like correct case depth and hardness are of prime importance for meeting the quality standards of the final product. These features can be monitored by destructive methods like sampling but with concurrent high personnel and financial effort. Moreover, a sampling inspection is sensible for statistically distributed defects only. During heat treat processes in furnaces or induction hardening, accidents involving single parts and that violate statistical distribution laws happen. These "unexpected" defects can be missed by sampling. 100% testing is required to reliably detect them. 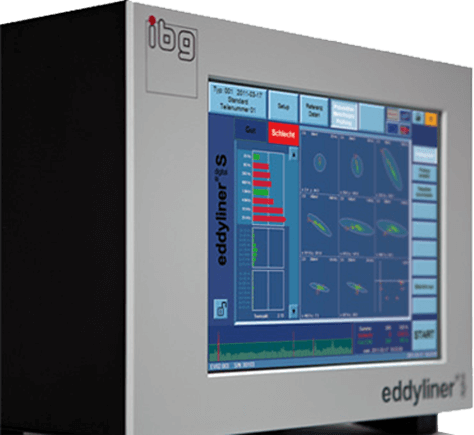 Eddy current structure test utilizing the well known Preventive Multi-Frequency Technology (PMFT) and Simultaneous Harmonic Analysis by ibg guarantees maximum test reliability in 100% testing. 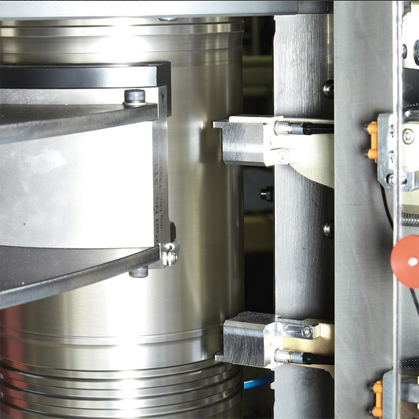 Heat treatment results in serial testing can be monitored cost efficiently, quickly and reliably, and even unexpected defects are detected with highest reliability. The eight test frequencies of the fundamental wave as well as analysis of two harmonics of the PMFT guarantee highest reliability. 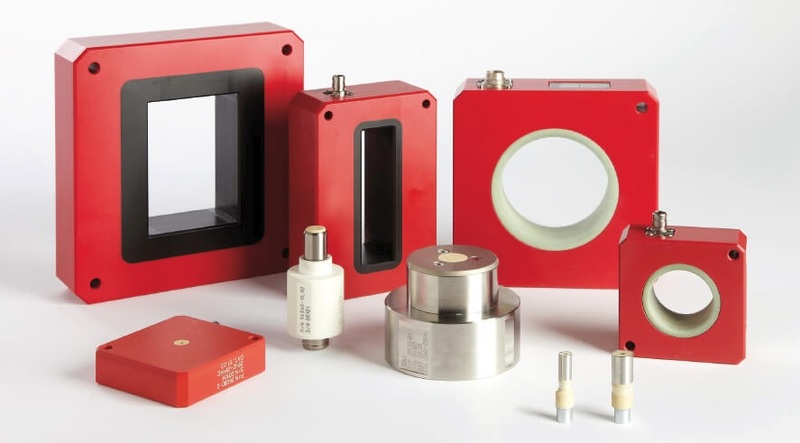 The field of application for PMFT with simultaneous harmonic analysis is very wide and includes eddy current testing of surface hardness, case depth, intermediate structure, material mix-up and others. Setting of the instrument is done with good parts only. 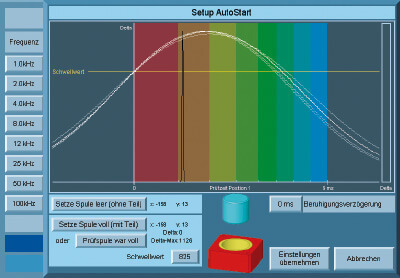 10 to 20 parts are presented to the instrument, and tolerance zones are formed automatically. Eddy current signals from subsequent parts are now compared with these good parts. 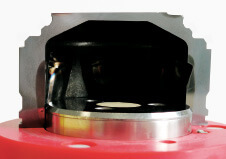 That means that no artificial defects are required for calibration, only known good parts. 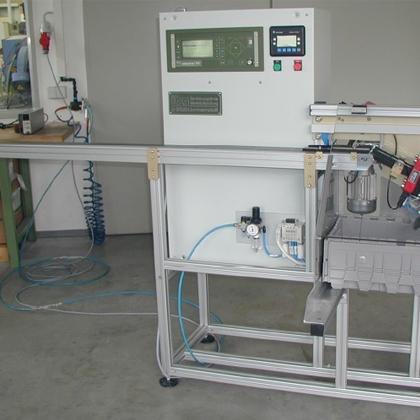 Due to the high test speed and the easy setup a new test task is ready to start within shortest time. 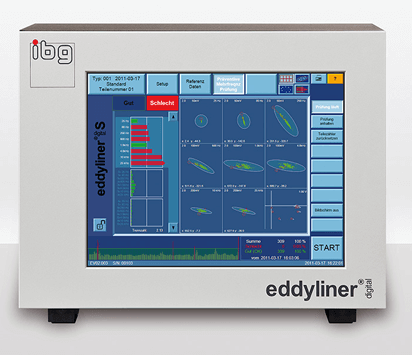 Another advantage is the multi-dimensional analysis of ibg eddy current test instruments. An individual tolerance zone is formed for each test frequency. If all tolerance zones are satisfied, one can assume that the tested part is okay. Even one single not satisfied tolerance zone classifies the part as not good. The relative permeability is strongly influenced by heat treatment processes. 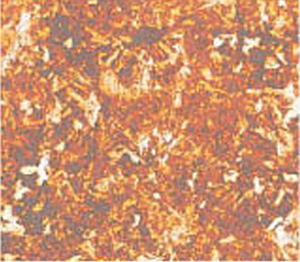 Hardened structures have a lower permeability than soft. Because the ibg Preventive Multi-Frequency Technology tests with small magnetic fields hardened OK parts show no saturation effects. It's within the linear range of the hysteresis curve. deviating from the real sine even at small field strengths. The fundamental waves, having been distorted by hysteresis, contain higher frequency harmonics. Fourier analysis of the distorted fundamental waves reveals the higher frequency harmonics, more precisely harmonics of the 3, 5, 7 or 9 times frequency. The analysis of these harmonics supplies a more detailed view of the magnetic features of the part and thus more exact information on the formation of microstructure. In addition, it offers significant advantages when suppressing interferences like batch scattering, part geometry and part temperature or positioning effects. Harmonic signals are very small. That's why immense electronic effort is needed in order to distinguish them from the basic noise. 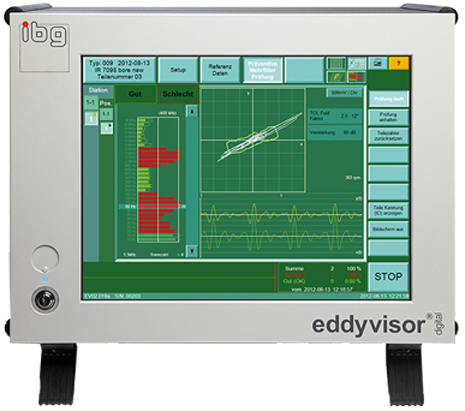 Such small signals can be detected clearly and processed robustly by ibg's unique digital eddyvisor® eddy current instrument family. An essential innovation is iSHA (ibg's Simultaneous Harmonic Analysis) - combined with ibg's PMFT it guarantees highest possible test reliability. It enables simultaneous calculation of vectors of the fundamental wave at eight frequencies and of two harmonics for each of them without extension of test time. It additionally uses high frequencies and their harmonics for a better solution of even smallest structure differences. Thus iSHA greatly enlarges the possibilities of the well-known Preventive Multi-Frequency Technology. Eddy current testing is based upon the electric conductivity and the magnetic permeability characterising the material to be tested. 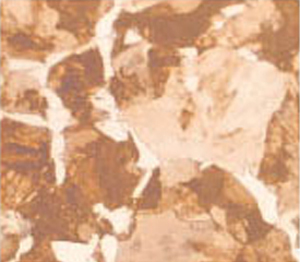 Different materials and microstructures have different conductivities and permeabilities that are detectible by eddy current. However, both properties also show a temperature dependency. Electric conductivity decreases by 4 % per 10Â°C. Variations of ambient temperature are compensated by ibg by means of the differential coil principle. Test coil is compensated by a separate compensation coil giving a differential test. ibg's new Temperature Adaptive Structure Test (iTAS) considers the influence of temperature fluctuation on the measuring values. 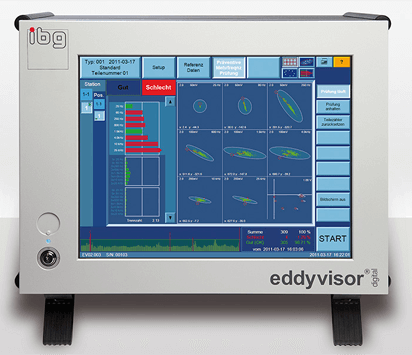 If the temperature of the test parts can be captured by an external sensor that is directly connected to the eddyvisor®, the influence of the temperature can almost be entirely compensated. Test parts appear as if tested at the same temperature. Pseudo reject is reduced and the test is more precise. The iTAS also enables quick visualisation of how big part temperature influence is in comparison with other parameter fluctuations (batch and dimension differences etc.) for a specific test application. 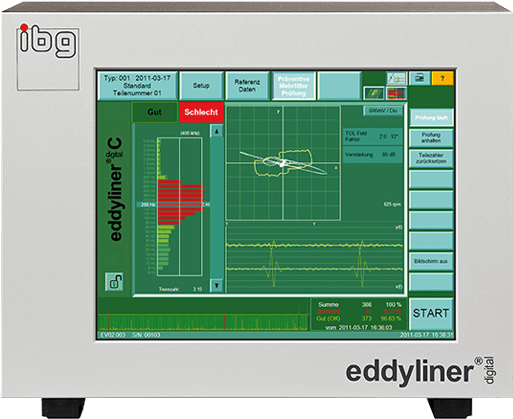 During material data recording the eddyvisor® automatically generates elliptic tolerance zones calculated for reliable testing. A tolerance zone editor is integrated for special situations in the structure test field. A skilful operator may freestyle the fields as rectangle, or ellipse, reduced or expanded, rotated or moved, etc. High speed testing within milliseconds. Using eight test frequencies and standard setting (25 Hz - 25 kHz), only 141 milliseconds are needed for the test. In high speed mode only 1 ms is needed for each test frequency > 5 kHz, very useful for very high speed dynamic testing. 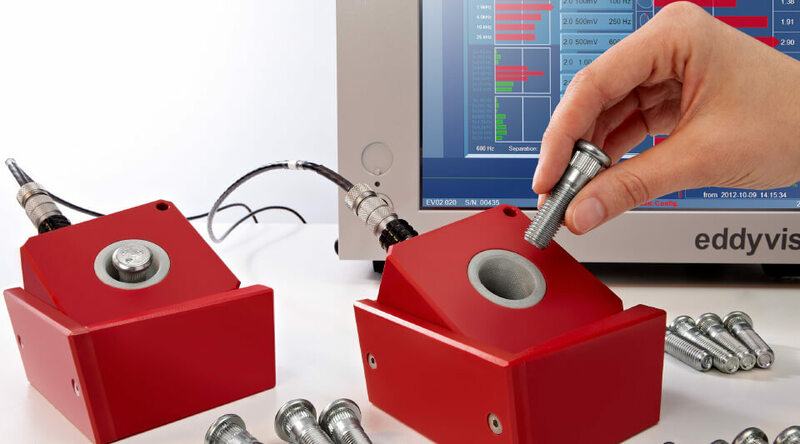 ibg NDT Systems - Designers and manufacturers of state-of-the-art NDT eddy current testing equipment, instruments, and systems for automotive, bearing and other metal components including fastener, forged and cast parts, hard metals, precision stamped parts, etc.